My sister-in-law recently sent me some pictures of her cute 10-day-old son. Her pictures were good, but she asked for some advice for how to make them even better. I’ve taken pictures of my own babies as well as for friends, and these are the things that have helped me be happier with the pictures form that stage. Those chubby cheeks and baby rolls don’t last forever. 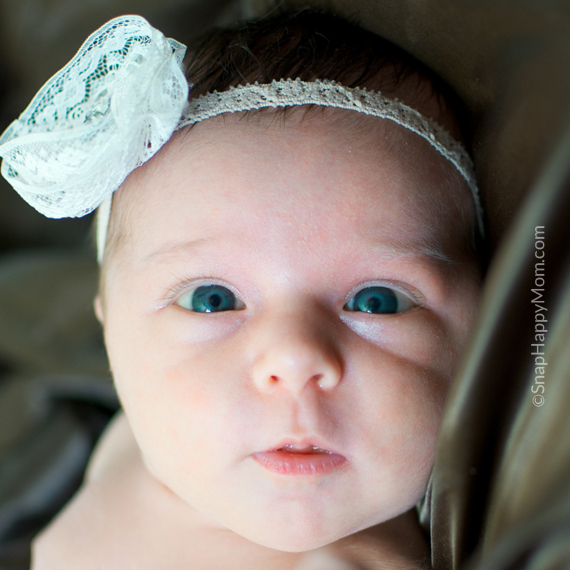 Frankly, the “newborn” look of a baby will be gone after just a few short weeks. He’ll lose that smashed up face and wrinkly nose. Take pictures of those sweet details before they’re gone. You want the wrinkly feet, the tiny fingernails and any hair they were born with (my babies lose it within days, and then they’re bald for 18 months!). 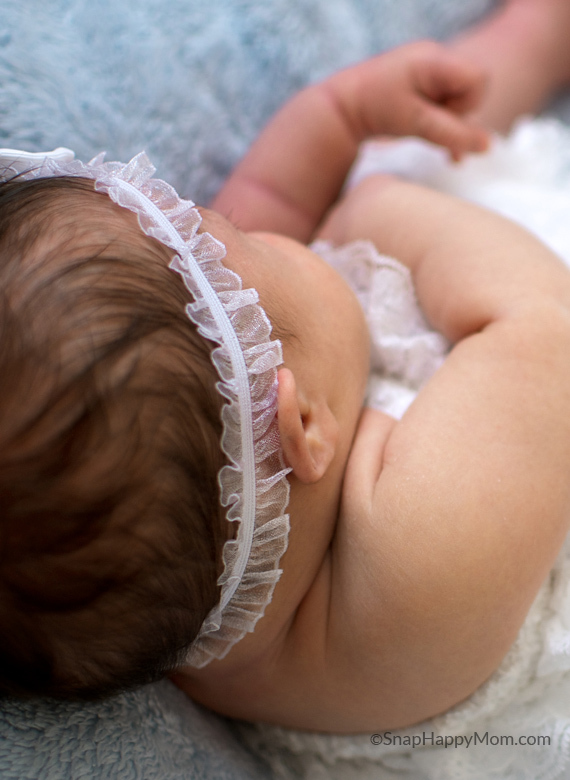 Get up as close as you can focus, with a wide open aperture (the lowest number), and take shots of all the little things about your baby. The sleepy stage is your friend. 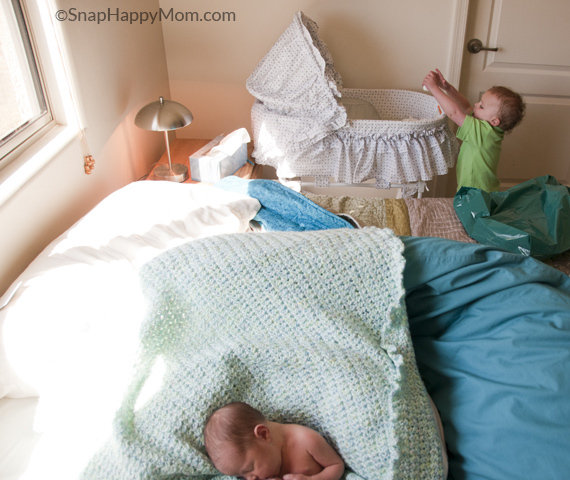 If you’re a first time mom, there’s a couple things you should know about timing. First of all, your baby is going to be in this super sleepy, fall-asleep-while-nursing stage for only 7-10 days. If you’re interested in those cuddly, sleepy pictures, you’ve got to do in within the first week. Yes, I know you’re recovering too- that’s one of the reasons people hire professional photographers sometimes! I’m just letting you know that the window for those types of photos is very short. 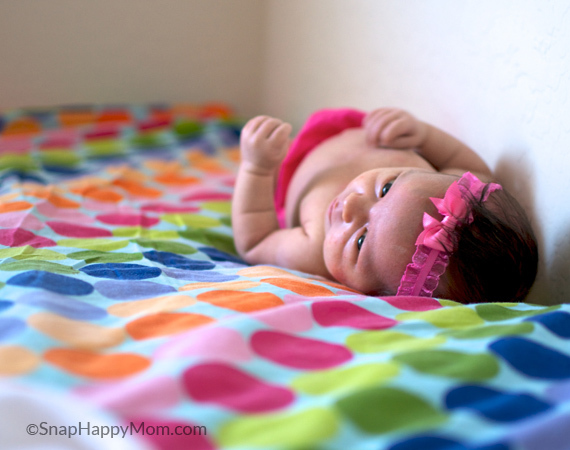 Happy baby means happy pictures. This means you need your baby to be warm and fed. Babies like to be warm, almost uncomfortably warm by adult standards. Cuddle that baby in a favorite blanket, or if you’re planning on taking diaper shots of your baby, turn up the heat in the room. Also, make sure that baby is well-fed just before you plan on taking pictures: even adults are grumpy when they are hungry! It’s all about the natural light. Shoot at the time of day when the room is bright but doesn’t have direct sunlight and the harsh shadows that come with it. Figure out which window/door lets in the most, brightest light. Put your back up against that window and shoot from there. Of course, don’t block the light with your body, but you want all that ambient light brightening up your baby’s features. For the most part, you want to avoid having the baby back-lit (which means having the light come from behind the baby). I found this picture from when I was trying to take some newborn pictures of my daughter. Forgive the mess (and what is my son doing back there?). I wasn’t intending to use this for anything, but it is a good example of how things were set up. See that bright white light over on the left? That’s the direct sunlight coming in the window, and it’s way too bright for portraits (everything will be blown out and way too contrasty). But my baby is curled up in a nest of pillows with an afghan thrown on top, just outside of that harsh light where there is lots of ambient light. I think I even twisted her more towards the window, so that the light would be coming from the front not the side. One of the big difference between professional newborn photography and shots you take take yourself will be the baby’s skin tone. 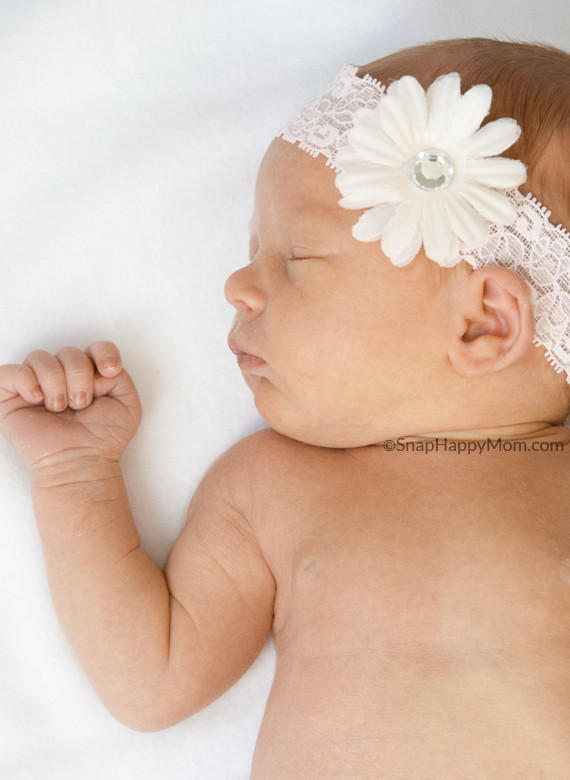 Most newborn photographers are going to edit the photo to really show off that baby-soft skin. Now, it takes a lot of skill to really get the look, but there are a few things you can do that will get you closer. Having all that natural light will definitely help, since the flash tends to flatten out all the contrast and tones in skin. Make sure you set your white balance correctly for the picture. You also want to make sure the picture is correctly exposed, which may mean over-exposing if you’ve got light skin on a light backdrop or blanket. If baby acne is an issue, take the pictures anyway. It will go away in such a short time anyway that it’s better to just get the newborn shots now. 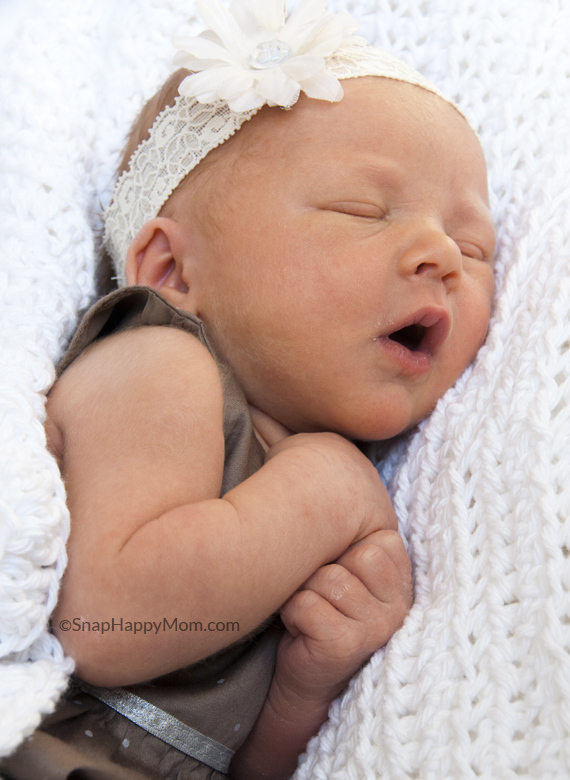 Capture the many faces of a newborn. 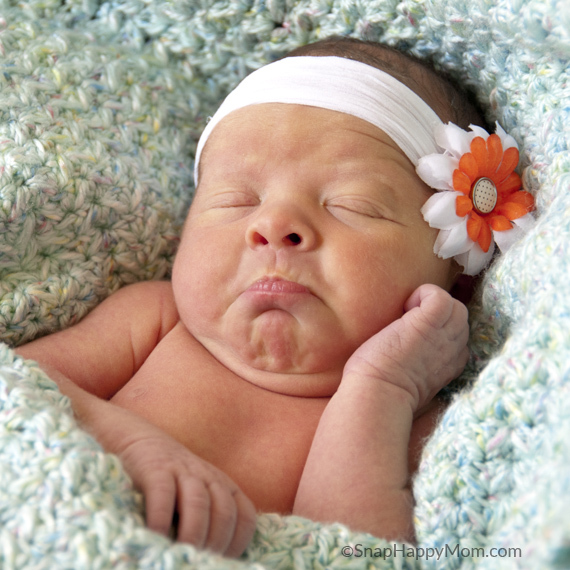 One of the things I love about a newborn is the many different facial expressions they have. Even without smiling or crying, they have a myriad of different “looks” or expressions. I know I could tell which look was hungry, or which was concerned, or which was just contented. Capture those expressions! They change all the time. Sure, you may be trying to coach out a smile for a baby announcement, but all the other looks are sweet too. Don’t over do the accessories. A few well-picked accessories are worthwhile: a favorite bow or headband, maybe a cherished blanket or heirloom item. Just don’t pick items that are so loud visually that they distract from the baby; in my opinion, the flower should not be as big as the baby’s head! For the most part, your baby is not going to like “costume changes,” so pick one outfit, and then maybe plan to to diaper shots after. Avoid words, message, and characters on the clothing, and stick to timeless solids and sweet details. Plain white onesies are fine here! The point is to get photos of your baby, and you’ll have plenty of time to take pictures with that zebra-print headband later. 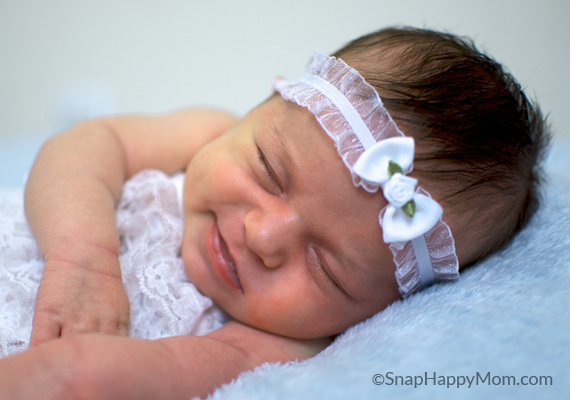 So, go snap a few pictures of your sweet newborn! Any questions? This is really good, Megan. 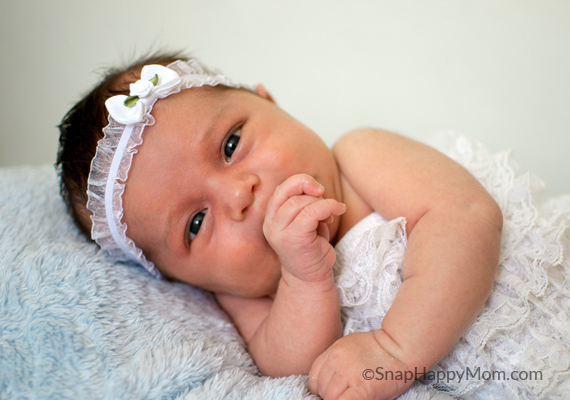 I’m so impressed with how knowledgeable you are and what beautiful newborn shots you’ve gotten. Way to go! Suggestion – how about a post on setting white balance? 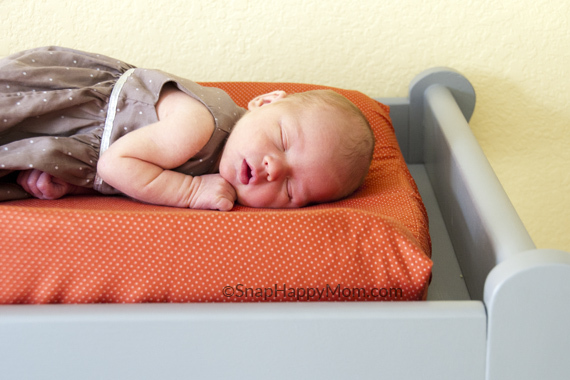 You know, we could probably arrange to take newborn pictures… let’s talk about this! I’m so excited about your upcoming baby! And yes, I’ll keep blogging, and you’ll keep learning how to use your camera. Deal? Yay! I like this idea. I’ll let you know when the baby arrives and see if it works out for you to come visit me 🙂 As for learning, I read every post but I’m honestly a little petrified to get out the camera and “play” with it. Love the comment you made about knowing your camera first and the fact that postpartum can make it a worse situation than it really is… I am searching the internet tirelessly and can not find anything that I can truly understand on how to use my Nikon camera. Any suggestions? Recently my wife just had a baby and someone asked us when we were having newborn pictures done. You mentioned that you baby is going to be in this super sleepy, fall-asleep-while-nursing stage for only 7-10 days and if you are interested in those cuddly, sleepy pictures, you’ve got to do it within the first week. I had no idea that there are specific times for taking baby pictures. 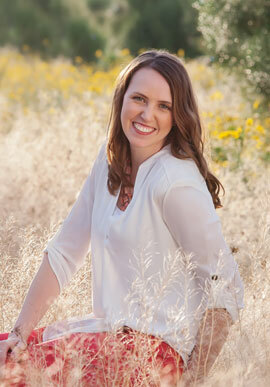 It seems that finding a professional photographer could be beneficial for us.